As the escalation of the conflict in Yemen enters its third year this week, the top United Nations humanitarian official has called on the parties to the conflict to commit to political dialogue and resolve the situation or risk an unending manmade crisis. 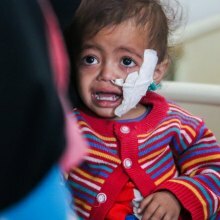 In a statement, Stephen O'Brien, the UN Emergency Relief Coordinator and Under-Secretary-General for Humanitarian Affairs underscored that in addition to wrecking the country's economy, killing thousands and displacing millions, the fighting has brought Yemen to the brink of a famine. “During my third visit to Yemen only weeks ago, I saw the terrible and terrifying evidence of looming famine,” said Mr. O'Brien. Underscoring that UN and its partners are already providing life-saving assistance in all of Yemen's 22 governorates, reaching almost 6 million people every month, Mr. O'Brien urged parties to the conflict to expedite immediate, timely, and unimpeded humanitarian access as well as facilitate commercial activities – critical to reversing prevailing massive food insecurity and ensuring that people's basic needs can be met. Nearly 19 million Yemenis – over two-thirds of the population – need humanitarian assistance and, according to UN Office for Coordination of Humanitarian Affairs (OCHA), seven million are facing starvation. “Most of all, the Yemeni people need the parties to commit to political dialogue, or this man-made crisis will never end,” noted Mr. O'Brien. As with most crises, it is the children who are bearing the brunt of the suffering. Families are having to resort to “extreme measures” to support their children as coping measures have been severely eroded, turning Yemen – the poorest country in the region – into one of the largest food security and malnutrition emergencies in the world, noted United Nations Children's Fund (UNICEF) in a new report, Falling through the Cracks today. “The war in Yemen continues to claim children's lives and their future,” said Meritxell Relaño, UNICEF Representative in the war-torn country.